There was a time when everybody in Naperville knew Robert Worthel, in fact, his name is prominently displayed just outside of the Naperville Police Department, along with the names of 11 other police department employees, including seven Naperville police officers who died while employed by the city. Robert Worthel was the Naperville police chief in 1917. He died on September 5, 1917, in the line of duty while responding to the scene of an armed robbery. His motorcycle was struck by a motorist who turned in front of him at Washington and School streets. He was 34 and had been with the department for five years. He was survived by his wife. Exactly 100 years later, Sargent James Galvan of the Richton Park Police Department read Chief Worthel’s story during roll call on Sept 5th, 2017 to honor him; an act of reverence and appreciation for a fellow officer. Police officers put themselves in potentially dangerous situations on a daily basis, while protecting us. They run towards what most of us run away from. We read about and see it occasionally in media, but not nearly as often as it actually happens. FBI statistics for 2018 report that 53 law officers were killed by offenders while on duty, and an additional 51 officers died accidentally on the job. These numbers are up by 10% from 2017. Naperville’s Riverwalk is considered to be the ‘gem of Naperville’, however there is another ‘gem of Naperville’ and it’s the Naperville Police Department. Under the leadership of Chief Robert Marshall, along with Deputy Chiefs Jason Arries, and Kathy Anderson, they have assembled an outstanding team of 271 employees including 169 sworn police officers. The Department has won numerous awards for its endeavors. While other police departments are seeing a decline of candidates for employment (unfortunately a sign of the times) Naperville is seeing an increase of candidates. With the possibility of 71 department employees being eligible for retirement shortly, high quality candidates are necessary to fill those positions. Naperville’s police department has earned the reputation for being ‘the choice destination’ for law enforcement officers, not because of the low crime rate, but because the department “does it right”, all the way from recruiting and interviewing, to training, recognition, and opportunity. I spoke with a high ranking officer of the Hanover Park Police Department and their pool of candidates is down, not nearly enough to fill its needs. He acknowledged that the NPD is the preferred destination in the Chicago area. While other cities are squeezing the budgets for their police departments, Naperville city officials have maintained a good budget for its police department, however if better is possible, then ‘good’ is not enough. If I were the ‘King of Naperville’, I would make two proclamations. My second proclamation would be for the Naperville Police Department to have a new Command Vehicle. If Lombard and Glendale Heights each have one, then the NPD surely has earned one. My first proclamation would be that the NPD should have and needs to have a Bearcat vehicle. Yes, it’s an expense but if each Naperville resident chipped in $1.75, that would be enough to make it happen. Better yet, Naperville city officials could reallocate some dollars spent on recycling and it’s leaf collection program for the purchase of a Bearcat vehicle. The name ‘BearCat’ stands for Ballistic Engineered Armored Response Counter Attack Truck. Bearcats are armored rescue vehicles with their primary use being to transport tactical (SWAT / Special Reaction Teams) officers to and from hostile situations and assist with the recovery and protection of civilians in harm’s way during terrorist threats, hostage incidents, or encounters with large gatherings of aggressors. Police departments including Naperville’s need all the help and support they can get, because the help and support they get, is used to help and support the rest of us. Makes sense doesn’t it. Just as Sgt. James Galvan of the Richton Park Police Department honored Naperville’s Police Chief Robert Worthel, Naperville city officials could honor Chief Worthel by naming the Bearcat “The Robert Worthel Bearcat”. That’s doing the right thing, and doing it with class. (This is the first part of a three-part series about the Naperville Police Department. The second part will cover the NPD’s Mission Statement, its Values, Department initiatives, and critical issues. The final part will cover Naperville’s outstanding Citizen Police Academy). Nine days remaining until Christmas day, which means in ten days the garbage and recycling trucks will be in high gear gathering everything we don’t want, including boxes, boxes, and more boxes. If you are into recycling, it could be the happiest day of your year. It’s possible your recycling bin will be jam packed with stuff. All the recyclable stuff that doesn’t fit, can go into the garbage can, or sit along side your recycling bin. You can be sure it won’t be the recycling guy taking the stuff sitting outside of the bin, it will be the garbage guy. Hopefully the garbage truck drivers are earning more than the recycling guys. The recycling truck guys must have a better union contract, because they will not get out of their trucks to pick up a perfectly beautiful cardboard box. It’s clean, empty, has no weight, but there it sits as the recycling guy drives by smiling. One would think that the recycling companies would be making more of an effort to capture as much recycling stuff as possible, considering the recycling industry is tanking. The culprit is China. Yes, when all else fails blame it on the Chinese. China has been the world leader for buying recyclables, but that pipeline is diminishing, due to China’s new anti-pollution program. Unless the recycling materials (plastic, metals, and paper) are 99.5% pure, China is not buying. That percentage exceeds the U.S. standard of 97% free of contamination (food, foam cups, etc). Since China is not buying, we are stuck with our own impure recyclables. Now rather than getting paid for recyclable material, we have to pay to get rid of it. That is not a long term good plan. Even when recycling was ‘profitable’, the general population was not on board with the concept, with the National average of 35%. Naperville had the highest rate among Illinois largest cities, at 30%, but is was still well below the National average. If only those recycling-truck drivers would get out of their trucks and pickup a box here and there, Naperville could have exceeded the National average. As it has turned out, maybe it’s just as good that the recycling guys drive by smiling without picking up big, beautiful, sturdy boxes sitting at curbside, because now we don’t have to pay to get rid of the stuff. The garbage guys can take it and fill up the landfills. Isn’t that what a landfill is for, to fill it. If we want to save even more money, why not have the garbage guys pick up the recycling bins, and toss them into the landfill; bingo, another problem solved. Solving problems is not that difficult. The definition of ‘serendipity’ is ‘the occurrence and development of events by chance in a beneficial way’, or simply stated ‘a stroke of luck’. Naperville city officials might want to consider establishing a new Department of Serendipity within city government. Naperville city officials are on roll of good luck. Earlier in the year, they called for resident-volunteers to create a group called ‘Drain Defenders’ to help unclog street drains of leaves and debris. When rain, a snowstorm, and ice hit Naperville November 25, it covered piles of leaves on about 40% of Naperville’s streets. Snowplows then pushed piles of leaves around many of which found their way to covering street drains. Bingo, Drain Defenders to the rescue. Depending upon how many residents volunteered, Naperville has either an army of Drain Defenders (which is what is needed especially now) or if just a few folks volunteered, making the ‘army’ more like a gang. Either way, one Drain Defender is better than none. During that same weather event, traffic signals became covered with ice and snow making it nearly impossible to see the stop-and-go lights. A few accidents occurred in Naperville, fortunately with no serious injuries. Apparently the problem was another ‘Trifecta of Nature’, 1) blowing snow, 2) it was wet and icy, and 3) newly installed LED traffic signal lights throughout Naperville don’t heat up enough to melt snow and ice. Here comes the serendipity part, why not have city officials reach out for a new opportunity; a resident-volunteer group called ‘Traffic Signal Light Defenders’. Just like Drain Defenders, people can volunteer to clear off traffic signal lights. The city issued the first 100 Drain Defenders with a rake, a shovel, and a nifty orange vest, they could do the same with Traffic Signal Light Defenders by issuing an inexpensive tall ladder, an ice scrapper, a huge can of Rain-X, and florescent orange vest. Naperville city officials have always wanted residents to be more involved with city government, this would help achieve that goal. The ultimate goal could be to have every Naperville resident volunteer to do something, in essence cutting expenses and lowering the budget. It would almost be like a colony of bees with everybody doing something. Timekeeper…residents can tell speakers when their 3 minutes are up during public forum. Better than paying the current time keeper. BS detector…they can Google every ‘fact’ the council states, if it doesn’t pass muster, an emoji of shame is shown over the person who made the fake statement. To think it all started with Drain Defenders. Well, it actually started with Naperville city officials not having a better, well-thought-out plan for removing leaves from city streets. It’s been said that given a sufficient amount of time anything that can happen will happen. It didn’t take long for it to happen in Naperville. November 25th, the day the Trifecta of Nature occurred; rain, snow, and ice, on top of piles of leaves on the streets of family-friendly Naperville. It was a beautiful sight, unless you had to drive or had leaves neatly piled at curbside. 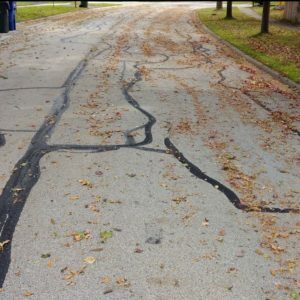 Over one-third of Naperville’s residents, primarily on the south side of town, still have leaves in their streets, but no longer neatly piled at curbside. The snow plows made sure of that by re-distributing the mess, much of which will find its way to Naperville’s street drains, where they may still be sitting until spring or when Naperville’s newly formed army of resident drain-defenders get to work with their rakes and shovels pushing it elsewhere. Naperville’s curbside leaf collection program includes three leaf collections; one every two weeks scheduled to end this year on November 30. It ended five days early when Naperville had to convert all of its 22 trucks for snow plowing. So residents were left with wet leaves and soon to-be clogged street drains which can lead to flooding in spring. Naperville city officials knew this could happen, but other than forming an army or likely a gang of drain-defenders, they did nothing to increase their odds of successfully keeping the streets clear of leaves. I don’t ever remember this being an issue when I was young, back when dirt was new. I do remember the autumn aroma of leaves burning, a sure sign that fall had arrived. I also remember the sound of fire engines racing through neighborhoods. Naperville city officials (who are they?) did say that if storm sewer drains need to be cleared. the city can help if it becomes an issue. It would seem to be a good idea to do it now, rather than waiting until spring flooding. Apparently it became an issue last Wednesday when enough residents complained to the city and on social media, and city officials had no choice but to reverse its decision to cancel the last leaf pick-up cycle, and decided to complete the third round of leaf pick-up. So now it becomes a race between trucks converted for leaf pick-up and trucks converted for snow plows intermixed with garbage and recycling trucks, along with drain defenders against lots of frozen and wet leaves which have been plowed all over the streets and squashed by cars, trucks, and school buses. In the meantime, let’s hope the army/gang of drain defenders are up to the task of working overtime and have the ability to dodge trucks picking-up leaves.